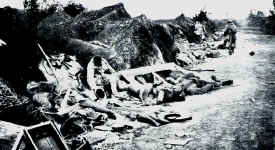 The attack on the left riverbank is executed by the VI German Reserve army corps. At the same time an attack on Fort Vaux will be launched from the right riverbank. 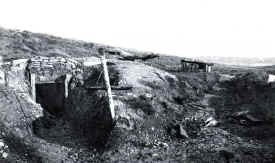 The most important aim of attack on the left riverbank is a hill (height 295 metres) called Le Mort Homme [The Dead Man], which serves as a lookout point for the French and is therefore valuable to the observations of the artillery. After Le Mort-Homme is taken, the attack on the Bois Bourrus can begin, where the French artillery is concentrated. 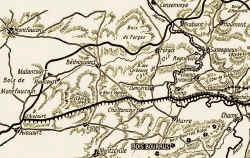 The preparations for the attack have not escaped the French and on the 6th of March, there are four French divisions present in the lines of defence. Monday - 6 March The attack starts with a heavy preliminary bombardment that is aimed at the inexperienced French 67th division, which forms the first line of defence. The Germans cross the Meuse fairly easily at the villages of Brabant and Champneuville. French artillery fire comes from the Bois Bourrus but has little effect because the grenades do not explode; they are smothered in the swampy ground. The French defence becomes discouraged and weakened and in the evening the villages Forges and Regneville are taken by the Germans. The Western part of the hill, Côte de l’Oie is in German hands as well. Tuesday - 7 March The Germans march on to the Bois des Corbeaux and occupy this, under protection of their own artillery. The French defence is breaking down. 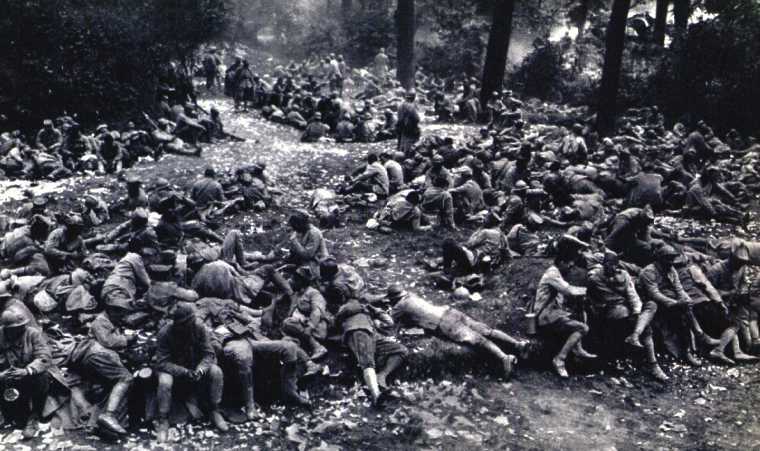 At the end of this day, more than 3.000 French have surrendered. Le Mort-Homme seems to be in reach. Wednesday - 8 March Early in the morning, however, the French launch a counterattack with great zeal. 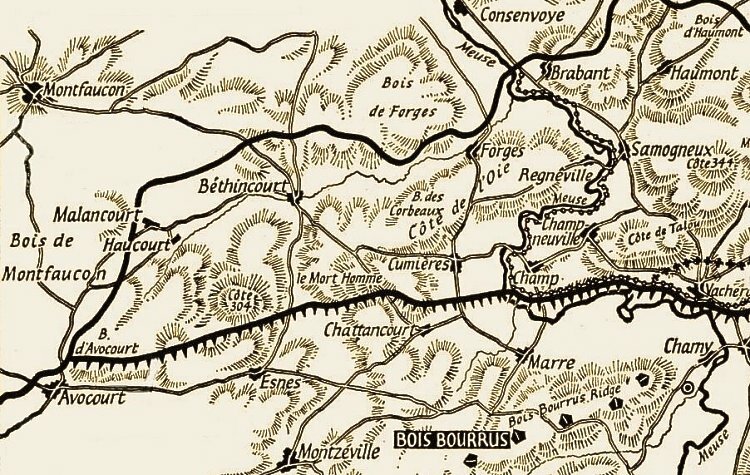 The Germans have not consolidated their conquered positions and at the ending of the morning the Bois des Corbeaux becomes French territory again. The planned attack by the Germans on Le Mort-Homme is cancelled and on this day the Germans are forced into a defensive position. Thursday - 9 March A German attack on Le Mort-Homme is launched from Bethincourt but the French have regained their line of defence and the German attack is turned down. Friday - 10 March The Germans are attacking again with verve and recapture the Bois de Courbeaux at the cost of great losses. In the following days a battle unravels that lasts four days and goes back and forth continuously. Every attack is answered with a counterattack. Nothing and nobody is spared. Eventually the front stabilises around the line Bethincourt-Cumières. The losses on both sides after this period are enormously: 89.000 French are dead, wounded or missing; 82.000 Germans are wounded, dead or missing. Tuesday - 14 March Again a massive German attack is launched at Le Mort-Homme but the advancing main force is taken under fire by the French with enormous power. They are firing from the nearby Côte 304 [Hill 304], where a large French concentration of artillery is situated. 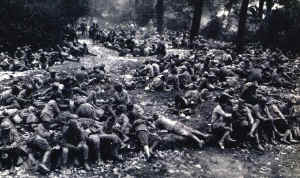 If the German attack stagnates with great losses on the hills of Le Mort-Homme, the German army leaders decide to relocate the centre of attack to Côte 304, which from that moment on is perceived to be the key to conquering Le Mort-Homme. Monday - 20 March The German main attack is now launched from the West at the front line Malancourt-Avocourt. At Avocourt they move on quickly to the Bois d’Avocourt where the 29th division is located, which is destroyed completely. It is even believed that treason was committed on French side; defectors were supposed to have given away the French positions to the Germans. More than 3.000 men are made prisoners of war, among them are a brigadier general and two regimental commanders. In France this defeat is considered a national disaster. After these events all battles concentrate around the Bois d’Avocourt en from Tuesday - 21 March onwards there is heavy fighting over every metre of ground, which causes great losses on both sides. It is a massacre under the worst possible weather conditions. It rains heavily; wounded drown in the mud. Soldiers loose their boots in the sucking soil. Guns and mortars sink into the mud up to their axes and cannot be moved. 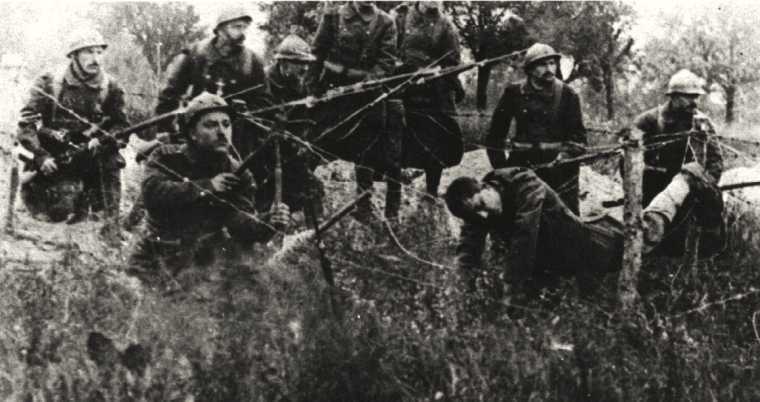 Whole German battalions are slashed, sometimes until the last man, by camouflaged French machine guns. The French artillery firings are just as heavy as the German ones. Thursday 23 March At the end of the day the battle is stopped for the time being. At the end of March a German attack on Côte 304 is launched from the North: the villages of Malancourt (31 March), Haucourt (5 April) and Bethincourt (8 April) fall into German hands. Côte 304, however, remains French. 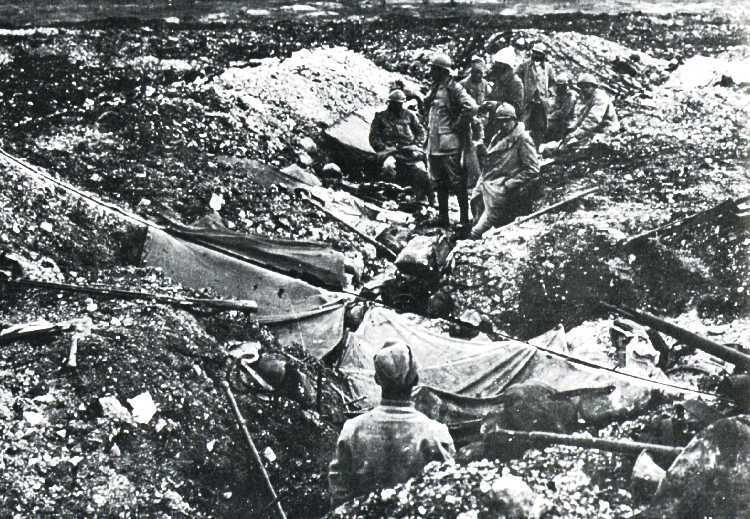 Both sides are reporting cases of battle weariness: German and French units refuse to leave the trenches, insubordination is common, troops surrender willingly. The extent of what is humanly possible to endure appears to be reached. Sunday - 9 April The Germans change their tactics of attack; they decide to attack on both riversides of the Meuse at once. At the left bank Côte 304 and Le Mort-Homme are attacked simultaneously. General Von Gallwitz receives the command over all troops on the left bank ('Angriffsgruppe West'). The Germans bring extra material and troops into the battle. At French side hardly any reserve troops are available. Again the attack starts with a heavy initial shooting (5 hits per minute were counted). The entire crest of Le Mort-Homme is surrounded by smoke and dust. The German attack is gaining ground but only reaches, again with a great loss of troops, the lower crest of the hill Le Mort-Homme. The higher crest of the hill is situated a few hundred metres further up; a crest which is 3 metres higher than the first crest (height 265 and height 295). 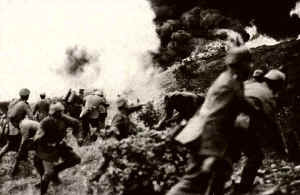 The German lines are under constant fire from the Côte 304. The battle is shifting constantly from one crest to the other; it is the most horrible battle ever fought on the left bank. Whole companies are decimated on both sides (a French company of 165 men, returns from the front with 35 men), food and drink is not available for days, wounded are not taken away, dead are not buried. 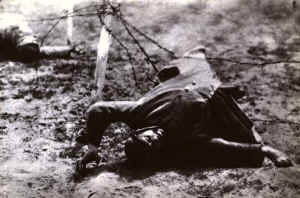 The shootings are considered to be worse than the ones later that year at the Somme-offensive. 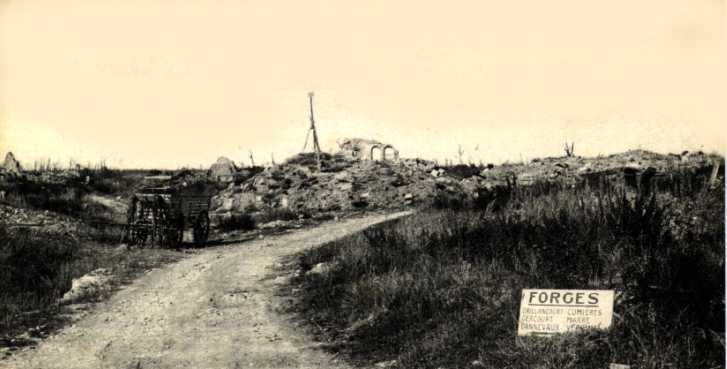 From the Côte 304 the French prevent the Germans from installing their artillery lines and observation posts, because of their artillery fire from cable balloons and aeroplanes. 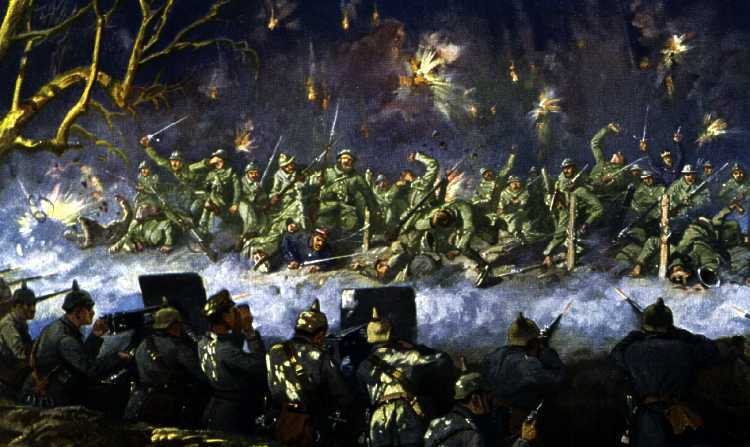 It is almost impossible for the German infantry to dig themselves in; their positions are barraged day and night. General Gallwitz succeeds in convincing his senior officer Knobelsdorf that it is pointless to attack Le Mort-Homme before Côte 304 has been taken completely. In the period which follows the 9th of April it rains 12 days in a row. The troops are literally standing in water up to their knees; nobody has one dry garment left. After this period of rain French counterattacks follow, which drive away the Germans from the hills of Le Mort-Homme. In the meantime preparations for the attack on Côte 304 have begun. General Gallwitz, an artillery officer, decides to go about it on a large scale: 500 heavy guns take under fire a front which is hardly wider than 2 kilometres. Wednesday - 3 May On this scorching hot day a bombardment begins which lasts for 36 hours with utmost intensity. The French suffer horrible losses. At the front chaos rules: men are buried alive, there is no food and nothing to drink for days in a row; the thirst is so unbearable that some men are drinking their own urine. Screaming wounded are everywhere who cannot be taken care of. There is an unbearable smell of decay; estimations mention more than 10.000 deaths. 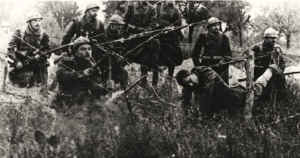 In the night of the second day the Côte 304 is attacked and taken from the French who are completely broken. After this it takes another three days of bitter man against man fights, before Côte 304 is entirely in German hands. (Note: the bombardments have been so heavy that, with time, Côte 304 would become 7 metres lower). The road to Le Mort-Homme is finally cleared. Here a heavy bombardment is launched as well. Le Mort-Homme seems more like a volcanic eruption. The sky and the earth shake beneath the thousands of exploding grenades. The chaos is complete on both sides: on German side 13 regiments are at one point in the lines of defences, without any form of leadership or co-ordination. Reconnaissance planes report a column of dust with a height of 800 metres. The French resist fiercely but have to cave in at the end of the month of May. Le Mort-Homme is finally in German hands. The villages of Cumières and Chattancourt are taken as well. Finally after 3 months of uninterrupted battle, the Bois Bourrus is reached. The German and French armies are completely exhausted: not only the French, but the German regiments also 'bleed to death' in this horrible battle.